A “gutted” Chris Robson has vowed to come back stronger next season after his Buckingham Town side finished their 2014/15 campaign with two heavy defeats this week. Robson also admitted that he has found his first season in management much harder than he expected, with the Robins finishing their UCL Division One campaign 16th following a 5-1 defeat to Thrapston Town on the final day. That defeat was then compounded on Tuesday evening when Buckingham crashed out of the Buckingham Senior Charity Cup after a humiliating second leg defeat to local rivals Olney Town. Buckingham had led 2-1 after the first leg but they were hammered 6-1 on Tuesday to bow out of the competition at the semi-final stage, with Olney going on to face Buckingham Athletic in the final. Speaking afterwards, Robson said: “To be honest, I am gutted. Going into the game we thought we were so close to making the final, but in reality we were a million miles away. “Watching that performance tonight hurt a lot. It was a cup semi-final against our league rivals and we waved the white flag from the first whistle. I cannot understand how we can fall apart like we did. “I’m just gutted for the club. It was a huge game and a chance for us to get to a final back in Buckingham. It could have been the final everybody wanted – Town versus Athletic – but we let everyone down tonight, the committee, and the fans who turned up in good numbers tonight. It hurts. 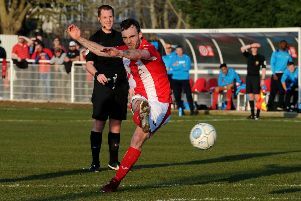 Robson, who took charge of the Robins last summer, is confident his side can improve next season after admitting his first season as a manager has been a big learning curve. “It was disappointing to end the season like that,” he added. “But now I have the job to make sure we have the right players on board to massively improve next season. “It has been a big learning curve for us and now we know what we do and don’t need for next season to compete. “At the start of the season I am sure we all had high hopes for a good season. We built a good squad in pre-season and things started very well. “Unfortunately when you play well, and your players do well they attract interest from other clubs and we lost a number of players to clubs that at the moment we cannot compete with financially or with their setups. “I have learnt so much in my first season in management. It has been very hard, harder than I could ever imagine. “Thankfully we have managed to now build a good squad, with great lads. “We have a good mix of youth and experience, and also four or five match-winners. They all have a good understanding, and the spirit in the dressing room is good. “They understand the way we want to play, and it is no coincidence that since the squad has been settled we have been unbeaten in the past four weeks, except for the bad finish against Thrapston and Olney.